With each new film by Greek auteur Yorgos Lanthimos, one prepares to see something daring and odd, and to be made uncomfortable and laugh as a defense mechanism to make the dread feel more palatable. Co-written again by regular collaborator Efthymis Filippou, who helped director Lanthimos make 2010’s “Dogtooth,” 2012’s “Alps,” and the strangest, most absurdly funny and wince-inducing dystopian-romance with 2016’s “The Lobster,” “The Killing of a Sacred Deer” is their Kubrickian horror film with Greek tragedy leanings (the title refers to the Greek myth of Iphigenia) but their own completely unique rhythm. Watching the disintegration of a family as a result of the patriarch's past mistakes, it is nihilistic, perverse, bleakly amusing, and tough to shake. 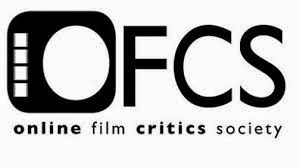 Opening with a close-up and reverse zoom of a pumping ticker during open heart surgery set to a mournfully symphonic piece by classical composer Franz Schubert, “The Killing of a Sacred Deer” sets its specific off-center tone with clinical detachment, which is apropos in that it involves a heart surgeon and his family. 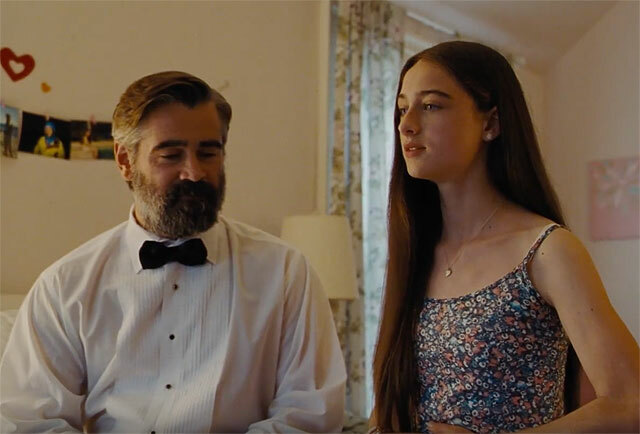 Steven Murphy (Colin Farrell), a cardiologist, and wife Anna (Nicole Kidman), an ophthalmologist, have two children, teenager Kim (Raffey Cassidy) and pre-teen Bob (Sunny Suljic). Their well-off lives in Cincinatti hold very little concern outside of who will water the plants and who will take the dog for a walk. For months, Steven has been having walk-and-talk meetings with a 16-year-old boy named Martin (Barry Keoghan), the son of one of Steven’s former patients who died on the operating table. Martin eventually ingratiates himself into the Murphy family and even invites Steven over for dinner as a rouse to set him up with his widowed mother (Alicia Silverstone), but when Steven rebuffs her advances and tries lessening his time with Martin, it’s there that an indescribable disability befalls the Murphy children. If Steven doesn’t make a sacrifice, it could result in something worse for his family. Controlled and methodically paced, to the point that some viewers may find it too sedate, “The Killing of a Sacred Deer” is a parable of mystical evil that defies logic and science but concludes with fateful, harrowing consequence. It’s cryptic and completely of a piece with Yorgos Lanthimos’ previous films that resemble the real world but in a way that's heightened, warped, and played by the filmmaker’s own rules. The film holds the viewer from the start, introducing an atypical, almost-clandestine relationship between an adult man and a teenage boy and keeping the nature of that relationship a mystery. Once Martin’s aims become slightly more clear, Lanthimos keeps turning the screws with little relief or compromise as Steven and Martin’s power play grows more obsessive, karmic, and cruel. The whole ensemble is attuned to writer-director Lanthimos and co-writer Efthymis Filippou’s style of speech pattern, which is matter-of-fact but stilted. For a while, until emotions break through, every character could be a robot in search of sentience and humanity. 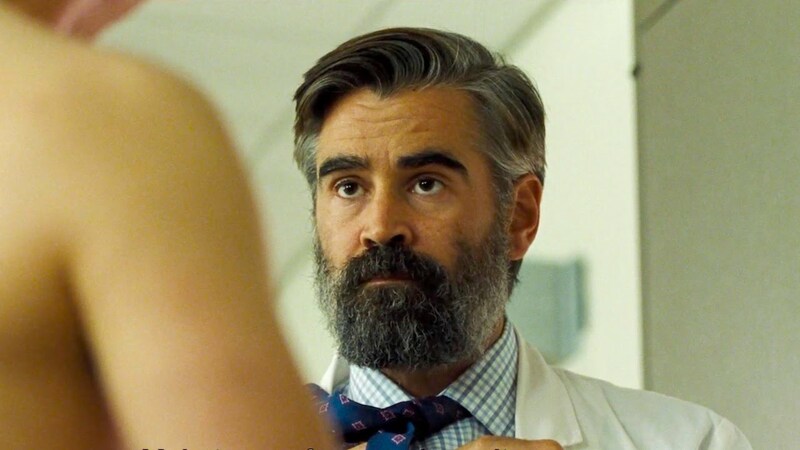 Colin Farrell, sporting an impressively full salt-and-pepper beard, is commanding as Steven Murphy, playing him as a family man who sees himself as infallible when an operation goes wrong but crumbles when someone else takes his power. When the time does come, he will have to make a decision and take responsibility. With her hairstyle resembling that of her character in “Eyes Wide Shut,” Nicole Kidman is very good, playing up the banal role of a wife and mother but bringing an icy, forceful edge with a cracking brittleness. As children Kim and Bob, Raffey Cassidy (2015’s “Tomorrowland”), whose warbling of Ellie Goulding’s “Burn” does burn into one’s memory, and Sunny Suljic are more than up to the task of the film’s challenges, too. As Martin, who ends up going to extreme measures to cope with his loss, Barry Keoghan (2017’s “Dunkirk”) is subtle yet chillingly creepy in a way that gets under one’s skin; how he devours a plate of spaghetti is queasy and off-putting on its own. Alicia Silverstone also has one memorable scene as Martin’s lonely mother, who comes on strong in trying to seduce Steven when she comments on his “beautiful” hands. Plot holes do not exist in a film like “The Killing of a Sacred Deer.” While Martin does spell out the rules of his sinister intentions to Steven, how they happen are not easily explained and actually beside the point. Like many a film by Stanley Kubrick, there is a sterile elegance to the filmmaking and Thimios Bakatakis’ sublimely austere cinematography, from the use of tracking shots in hospital corridors, the way the lighting bounces off the walls, and the overall symmetry of the framing. 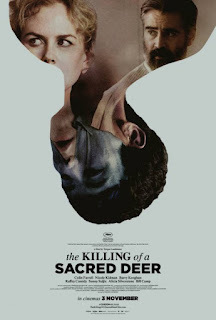 As disturbing as Michael Haneke’s “Funny Games” (either the 1997 or 2007 version will do) and most thematically similar to 2014’s Dutch oddity “Borgman,” the genuinely unsettling and provocative “The Killing of a Sacred Deer” is designed to stir up lively conversation, while sticking in the proverbial knife, twisting it, and leaving it there. It’s difficult to enjoy but even more difficult to forget or deny.